The White House prepares to welcome Pope Francis at the largest arrival ceremony that the Obama administration has held. President Obama delivers remarks welcoming His Holiness Pope Francis to the White House during the Pope's first visit to the United States. September 23, 2015. See photos of the visit. There are no tickets required for the papal parade, but security around the secure area will be strict. Gates will open at 4 a.m. and close promptly at 10 a.m. after which no one will be allowed in the secure area. For more information on the parade route and access, visit the Archdiocese of Washington's website here. When will the Pope visit the White House? His Holiness Pope Francis will visit the White House on Wednesday, September 23, 2015 at 9:15 am. How can I participate in the arrival of the Pope at the White House? The easiest way to participate in the Pope’s visit to the White House is to follow along for updates and watch the livestream of his arrival ceremony on this page. Tickets are required for admission—members of the public will be turned away without an event ticket. Prohibited Items: There are no storage facilities available on the White House Complex. Individuals who arrive with any of the following prohibited items will be turned away. Will the Pope’s arrival ceremony be broadcast online? Yes, you can follow along on this page (obamawhitehouse.archives.gov/campaign/pope-visit) for updates related to the Pope’s visit and a live broadcast of the event. Sign up here for updates. 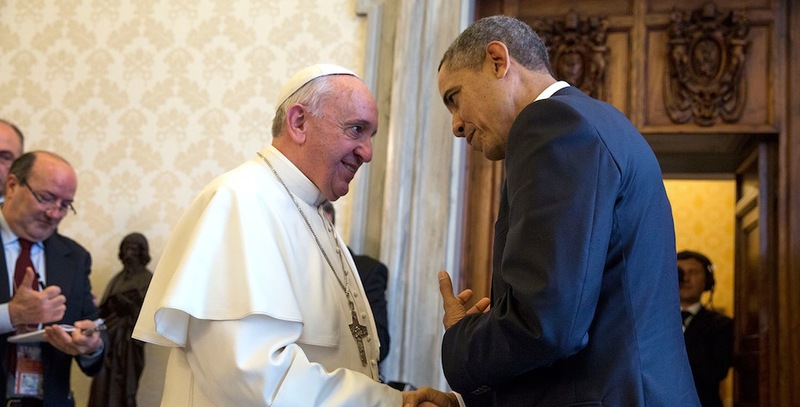 What will the Pope and President Obama discuss? I’m a member of the Press. How do I obtain credentials to cover the Pope’s visit to the White House? The event will be open press, but the deadline to RSVP has passed. There will be no exceptions made for last RSVPs. Where can I watch the Pope's visit online? Yes, you can watch live video of the Pope's visit to the White House right here on this page (obamawhitehouse.archives.gov/campaign/pope-visit). The United State Conference of Catholic Bishops will provide live streaming coverage of all events of the Holy Father’s visit on their website here. Videos will also be available on demand at online on this website. Where can I get information about getting around Washington, DC during Pope Francis' visit? For information about getting around Washington, DC during Pope Francis’ visit, please visit this WMATA website. Please also reference the following PDF of road closures and detours from the dc.gov here.